“This Thanksgiving, the men and women of the South Euclid Police Department have something very special to be thankful for. The grant from The Ben Roethlisberger Foundation will allow the K-9 unit to continue the important work we do.” — South Euclid Police K-9 Officer Michael Fink. 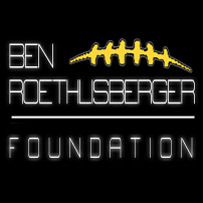 Today, Ben announced the sixth grant of the 2012-13 season from The Ben Roethlisberger Foundation at The Giving Back Fund. The Foundation will be distributing a grant to the South Euclid Police Department just outside of Cleveland, Ohio where the Steelers will play the Browns on Sunday, November 25th. The South Euclid Police Department recently retired beloved K-9 “Rex” in July, and plans to use the funds to purchase a new canine for their department. The funds will also be used to purchase a ballistic vest for the new dog and other necessary training and safety equipment. When the foundation contacted Officer Michael Fink to notify him of the grant, he had just called another department requesting K-9 assistance at an active crime scene. The new K-9 addition will fill an obvious void felt by the absence of K-9 Rex after 10 years of dedicated service. You can learn more about Ben’s Foundation here, or contact Stephanie Sandler at The Giving Back Fund! We’ve added a few more Lil’ Fans to Ben’s photo gallery! And appropriately enough on Thanksgiving Eve, we even have a “Ben Turkeysberger”! Erica Bruce tweeted this photo to the website’s Twitter page of her son, Gavin. 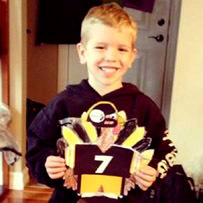 Apparently Gavin figured folks would pass on a tough-as-nails turkey! You can check out the latest Lil’ Fans here.